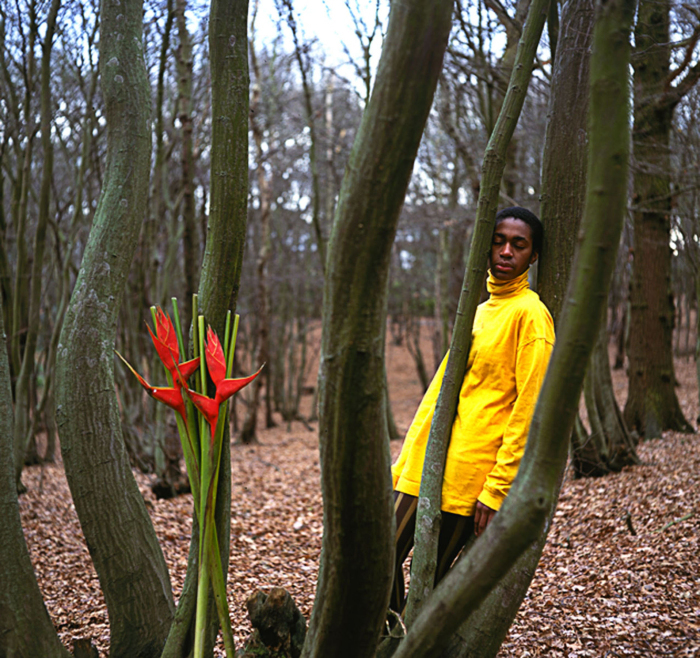 The works selected include Self Evident (1995) by Ingrid Pollard, a series of light boxes presenting colourful and picturesque full-length portraits taken in British landscapes, with each person holding a symbolic item that often evokes Britain’s colonial history. Larry Achiampong’s Glyth series (2013) consists of family photographs reworked with the faces being replaced by black circles with sharp red lips. Through the “mask”, the hidden and performed identities transpose on a personal photographic archive a symbol schematising the racial experience of figures perceived as alien. Zanele Muholi’s photographs She’ll, Umthombo and Dis-ease (2012) show a different aspect to her upfront visual activism. Trading her portraits and intimate scenes of the black South African LGBTI community, this series uses metaphors to depict the physiological patterns and aftermath of hate crimes committed against black lesbians. Each organic element evokes female and male private parts, and diseased cells. Cristiano Berti challenges the voyeurism and spectacle that often characterise Western gaze on the black female body. His sound piece Happy (2004) invites the audience to an imaginary mapping of a body which scars are related in Edo, a Nigerian language. Likewise Iye Omoge (2005), an installation consisting of site photographs, polypropylene maps and sound, articulates a compelling relationship between location and morphology in a context of migration and marginalisation. Finally the pictures taken by George Hallett in District Six and Bo-Kaap, Cape Town, in the late 1960s, mark the first traces of textual inscriptions in his work. These rare photographic inscriptions are tags mapping gang territories. They also contribute to convey the physicality of places that have been erased by the Apartheid regime. They are visual remnants of a lifestyle, culture and coding related to a marginalised existence then imposed on black bodies.